Hiking has become one of the most popular adventures that people take nowadays. Nothing compares to the feeling of being with nature and breathing fresh air. The silence and serenity that the woods can offer is like an escape to the chaos of the city life. However, certain preparations must be made before going to the desired location. If you are a first timer or beginner, you must buy the proper apparel and equipment that you need to bring for the trail. You must also be physically fit to endure the heat of the sun and the coldness of the night in case you’re planning to spend a night on the mountains. 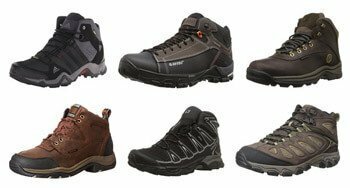 Most hikes involve a lot of walking so you must consider the type of boots to you wear which will offer you the most comfort and convenience. With the many choices of footwear in the shopping malls and online, it can be hard to choose what is really best for you. A pair of good hiking boots should match your bodily need for maximum comfort, stability, move with ease and support not just in the feet but for the whole body while walking the trail through different terrains. There are a lot of factors to look into before knowing if the footwear are good enough for you. Therefore, to make things easier we have done the research for you and documented the below. Have a read through our hiking boot reviews and buying guide to ensure you’re getting the best that money can buy. 1 Ahnu Montara Women Leather Synthetic 5"
2 Ahnu Sugarpine Women Leather & Textile Rubber 5.75"
3 Ariat Terrain H2O Both Leather Duratread™ 5"
4 Columbia Newton Ridge Plus Both Leather Rubber 4"
6 KEEN Voyageur Both Leather & Textile Rubber 4"
7 Merrell Moab Ventilator Both Leather & Textile Synthetic 4"
8 Salomon Quest 4D 2 GTX Both Leather, Textile & Synthetic Synthetic 6.75"
9 Timberland Chocorua Trail Both Leather Rubber 5"
10 Timberland White Ledge Both Leather Rubber 5"
Outsole – This is the bottom of the boot, the one transfixed to the ground and responsible for the protection against objects below. Outsoles should have a good compound make-up and rough pattern so that it will grip harder and dissipate water especially on a soft slippery trail. More on this later. 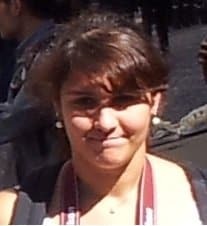 Upper – The covering or the face of the boots. It is responsible for holding the foot and protects it from scratches and other harmful insects or even snake bites. This part should be properly attached to the sole with a high quality, durable and perhaps waterproof material. Inner – These are the padding and inner linings inside. A padded tongue is always good. This is responsible for the comfort of your feet inside and helps with ventilation and sweat control. It should repel water and allow perspiration for healthy breathing of the feet. Also there are options to sometimes remove the insole to replace with your own. For example, those who have high arches may want insoles with more support. Lacing – These are the locking mechanism. The lace should be durable and the lacing style should not easily loosen. Likewise it must be easy to tie and stay tied, plus quickly undone when necessary. Some laces are made of plastic to further waterproof the design. Shaft – This is the height of the boot itself. Most of the shafts covered in our hiking boot reviews are approximately 4 – 6 inches in height, and is usually measured from the arch or the ankle. A higher shaft allows for more protection. Adequate ankle protection is a must depending on the types of hiking and trails your footwear will endure. Toe Bumper – The toe bumper here is similar to that of steel toe caps. There are numerous objects and possible calamities that you could literally stumble upon whilst on your adventures so it’s advisable to have some form of protection in the form of a toe bumper. Weighs between 1-3 lbs per pair. Anything in this bracket are considered as lightweight and are perfect for activities such as day hiking trips and backpacking. These are good for the occasional day hiker and can generally be compared to low rise hiking shoes but with a slightly higher level of ankle protection thanks to the higher shaft. 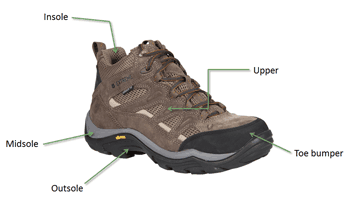 We have a few of these mentioned more in detail further below in our hiking boot reviews. Weighs between 2-4 lbs per pair. These are generally the popular option for both women and men, and are considered the best boots for hiking and backpacking due to their all-round performance. They are good for carrying 20-40 lbs of load, and especially keen to perform if traveling on different types of rugged terrain including steep gradients and off trail hikes. This class offer much better protection against the elements because they are often waterproof and made of tough durable leather for uppers with extremely well engineered rubber outsoles. The shafts are higher and tougher for added ankle support. 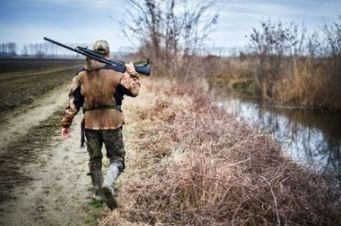 Heavy boots are made to last and experience the toughest conditions. Also known as mountaineering boots, these are perfect if you are carrying 40-50 lbs of load through high altitudes or generally unforgiving terrain. They are like the aforementioned style but on steroids, made of tougher and more durable materials, packed together to offer the utmost grip and protection through thick and thin. These aren’t everyone’s cup of tea, and would suit the occasional hiker as opposed to being used regularly as boots for day hiking. They will however last an obscene amount of time if used for easy hikes, but you’ll probably consider them as overkill and may even make your trail seem more difficult than it could be. 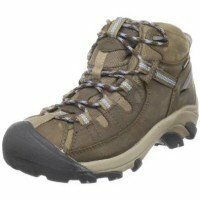 None of the hiking boot reviews below discuss this type, just making you aware of their existence. As previously discussed, weight should be an important decider. Choose lightweight hiking boots where possible but remembering it must still support your needs. The lighter the boot, the less work for your legs. Depending on the hiking trail you’re likely to frequent, it’s best to choose something that can tackle it with ease. No need for overkill though, as this will make your hike more difficult than it needs to be. After choosing the intensity of the trail or knowing your own potential, you should then decide whether you need lightweight, mid or heavy boots. The most important factor of all. After all, some backpacking trips and trails can be tens of miles, meaning you’ll be wearing those boots for continually long stretches. The best hiking boots will let you enjoy your time on the trail without feeling like a burden. This will be thanks to a good padded inner and sock liner, shock absorbing midsoles, seamless uppers and much more. If required, change the insoles for custom orthotics, however most standard fitted EVA, gel and memory foam insoles are more than suffice for the masses. Select the boot that provides great support on rugged terrain to avoid foot cramps and muscle discomfort. Be sure that the insole accurately support the arches of your feet and the shaft is high or low enough for the type of trail you’ll hike. Low shaft for easy hikes and higher shafts for more difficult terrain. 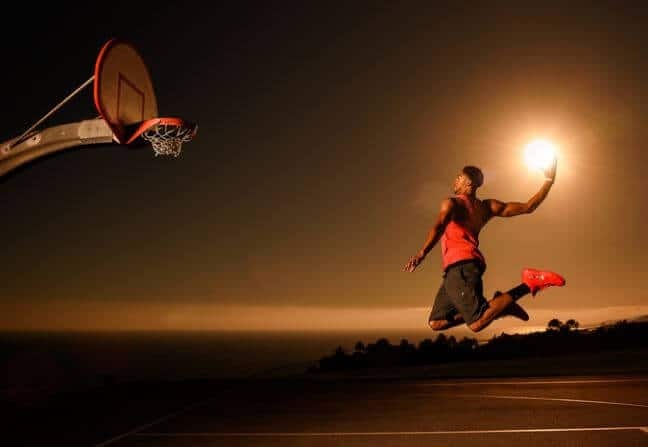 Ankle support and safety is paramount when out in these situations. This refers to a number of things such as the tread patterns on the sole and the type of material it is made of. Choose the tread patterns that have spaced lugs in various patterns because they tend to manage dirt, sand and mud by pushing them out of the bottom and sides with ease, kind of like off-road tires. When it comes to sole type, or material, there is no best or worst, simply what the manufacturer deems suffice. Rubber is common; there are soft rubber compounds which offer better grip but will wear out much faster. Likewise, hard rubber outsoles will last much longer but will provide less traction. Adventurous yes, but hikes and even simple camping trips can get dangerous at times. Your boots must work best in all weather conditions such as rain and snow, allowing you to continue on whether it’s hiking the Appalachian trail or trekking in Nepal. 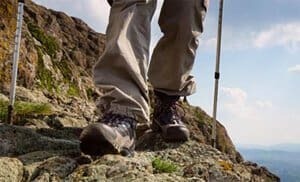 Good hiking boots can get you far and in comfort, but knowing your trail and planning your hike is important too. It’s very easy to get caught out, but opting for some versatile footwear with durable properties which can handle almost anything on your planned route is always a winner. Like steel toe work boots, some of those for hiking also have a protective toe cap. Most often these are extremely tough rubber as opposed to steel. Rubber is much lighter which makes walking a breeze, whilst steel will add unnecessary weight. Steel is good for protecting against tons of weight in the workplace but rubber is more than suffice for most trails. Also, shanks and plates are often placed in the midsole to protect against unwanted protrusions you may encounter such as rocks and branches. Finding the balance between waterproof hiking boots and ones with material that will let the perspiration to escape can be quite a task, but it’s essential. Breathable footwear is a must for maintaining healthy feet through lengthy hikes, but should you encounter water on your journey the footwear must keep your feet dry. Synthetics and mesh often provide good ventilation. As you can imagine, hikes and treks can be rather demanding on not just your body but no doubt on your footwear too. For safety and value, buy one which is sturdy, durable and capable of handling dirt and water without giving in. This will depend mostly on the upper and outsole material. Mesh, leather and most synthetic leather tend to be the most abrasion resistant and longstanding materials, as well as being waterproof and lightweight too. Although these aren’t exactly wading boots that we’re reviewing, almost every one of our hiking boot reviews below features a waterproof variant, that’s because the top rated are most commonly going to be waterproof. In our opinion there is no point compromising this feature (which is a common one at that). It goes without saying that being prepared is to prepare for the worst, and that means crossing streams, walking through snow and hiking in the rain. The Ahnu Montara is one of the best hiking boots for women on sale 2017. Its comfort, fit and weight is similar to that of some top rated walking shoes, but with the added traction, protection and stability close to that of trekking boots. It offers exceptional water resistance with 5” ankle height and can provide you comfort mile after mile. The midsole of the Montara is made with a dual density EVA that cushions and allows flexibility on the heels. The pig leather surrounding the ankle is soft to touch with excellent padding which offers lasting comfort throughout the trail. The tread and its level of ankle support may be suitable for tough trails but even better for the tougher trekking or very rugged terrain. 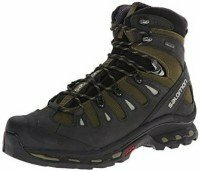 If you are confused whether to buy shoes or boots, this is a good choice because it features a combination of the two and suits most terrain for the everyday hiker. They say you can tell a lot about a man by looking at his shoes. The adage works equally well for women. 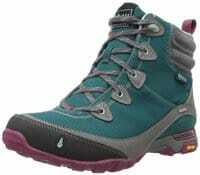 The stylish Ahnu Sugarpine are designed for that outdoors female of the new 21st century. Crafted from leather and textile this imported design comes with a durable rubber sole and shaft measuring 5.75” from the arch. The heel, on the other hand measures roughly 1”. This is a waterproof boot with a secure lace up vamp and a cushy padded collar. It also has a handy pull-on loop, rubber toe protector and EVA midsole. 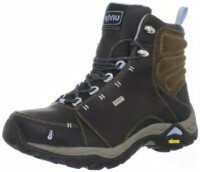 Also perfectly capable of being used as trekking or heavy backpacking boots, it comes with Ahnu’s Numentum Technology for a sturdy and stable grip when walking in unfamiliar territory such as canyons and dense forestry. The Ariat Terrain H2O is a pair of waterproof hiking boots that every woman would love to slip her feet into whether backpacking, camping or blazing up a rocky trail. These feature packed beauties are made of an oiled and full grain leather upper giving a beautiful texture, abrasion free surface and comfortable feel. A Duratread™ outsole makes up the rest of the boot with the generous and supportive shaft measuring 5″ from the arch. The heel measures approximately 1.52″ and the platform itself measures 0.75″. 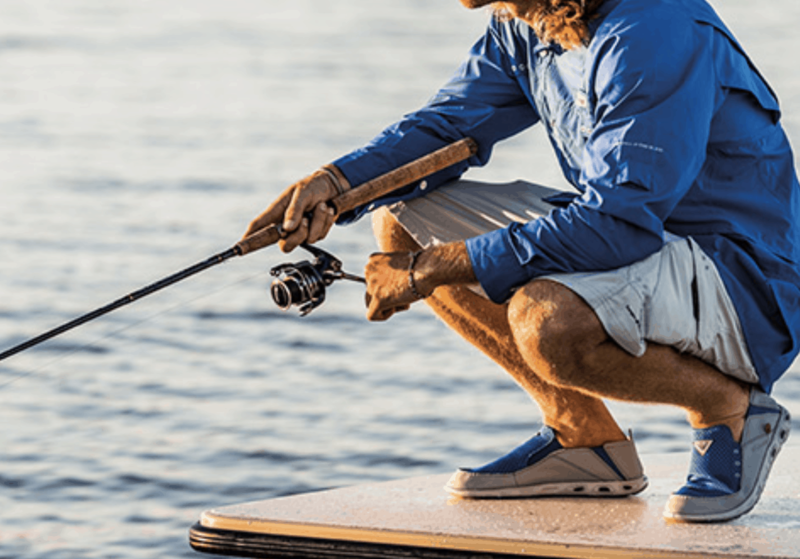 Additionally, the Ariat Terrain H2O comes with ATS® Advanced Torque Stability technology for added confidence during all seasons when tackling rugged surprises. 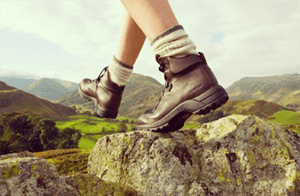 The moisture wicking lining and the padded collar adds to the level of comfort for the wearer, overall achieving top rated scores whilst ticking all the boxes; these are personally one of the best hiking boots for women we have reviewed so far. The Columbia Newton Ridge is Columbia’s contribution to the leather-synthetic market. Their products are manufactured using the best technology and highest quality materials so expect its product to provide you the optimum comfort and great value. The Newton Ridge are waterproof hiking boots constructed to protect against things like dew, stream water and showers. It has a breathable mesh that helps ventilate the insole and an Omni-Grip tread that grips the ground confidently. They may be relatively cheap in price compared to some other hiking boot reviews here, but it has a well-built structure suited for most hillwalking, trails and trekking. If you are looking for something that can go through difficult tasks like heavy backpacking, winter climbing and alpine terrain, this is the one for you. It is fairly light and easy to put on and take off, yet is made of durable material compared to others, and has nylon shanks that fit the heel for utmost support. The Newton Ridge is an above average all rounder available in men’s and women’s variants which is inexpensive and well suited for not only beginners but expert hikers too. The KEEN Targhee II Mid offers four wheel drive performance for your feet whilst walking any elevation or terrain. The multi-directional tread will give you a steady grip on all kinds of ground so no need to worry about slipping. Not only does it offer a waterproof breathable membrane to keep your feet dry and comfortable, the shank provides torsional stability for a secure ride, while the mid cut height increases ankle support through canyons and over mountain tops. These pictured KEEN’S are an ideal partner for anyone into serious hikes or treks, but also know there are women’s styles available too. The waterproof membrane has an additional barrier against moisture yet gives breathable comfort all day. Featuring a unique heel support structure designed to accommodate the feet on impact and prevent ankle injury, it also comes with a patented toe protector that wraps over the outsole for added safety. Additional measures for comfort are achieved by perfect arch support and padding that hugs the contours of your feet, all of which add extra spring to your gait. It has a shank that will stabilize your feet as you move, minimizing the use of strength so you can enjoy every moment of your hike. 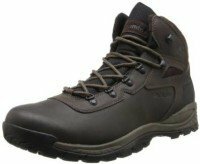 The Targhee II offers a sleek and sporty style that looks great with any apparel, making it not only one of the most stylish, but overall probably one of the best hiking boots for men in 2017. Your footwear will ensure whether the trip ends in a satisfying and refreshing manner or with blisters and sore feet. A pair of good hiking boots are thus imperative; perhaps something like the KEEN Voyager Mid should do the trick. They are made of leather and textile; the leather is waterproof and the mesh upper has breathable properties giving good ventilation for your feet. The rugged rubber outsole has 4mm cuts which dig aggressively into the surface of your trail providing traction all the way to the mountaintop. The basic measurements are – a relatively low shaft 4” from the arch, a decent 2” heel, and a raised 1.25” platform. The Merrell Moab Ventilator are some of the best backpacking boots for men that money can buy in 2017. Made of leather and textile they come with an impressive multi directional patterned synthetic sole which provides good traction for the feet when treading uneven terrain whilst ascending or descending various mountaintops. The clever tread pattern dissipates water and mud with ease, whilst also clawing into the ground as you hike. Also, the air cushion heel ensures the feet are well supported regardless of the terrain you are on. One of the challenges of hiking with limited provisions is foot odor; for this the Merrell comes with M-Select FRESH odor prevention which ensures your feet stay fresh for longer. The boot also features M-select DRY moisture-wicking mesh lining which circulates air and keeps your feet relatively dry in even humid conditions. The extremely popular Salomon Quest 4D 2 GTX are an exceptionally comfortable pair of mid hiking boots, which is also ideal for all season trekking, long distance thru-hiking, canyoning, backpacking and scrambling. It has enough ankle support to carry even the heaviest loads comfortably. Being equipped with Gore-Tex protection means that your feet stay dry when you cross water yet is breathable enough so you will not have blisters after spending even a number of days on a lengthy trek. It has a gusseted tongue and a mud guard to keep the feet safe on wet grounds. The lacing system which wraps to the top of the lengthy 6.75″ shaft is adjustable depending on the kind of situation you are in, and the tire-like outsole is flexible enough to give you stability on unexpectedly rough terrain. The traction is made of multi-directional lines that offers superior grip on slippery rocks and wet soil. 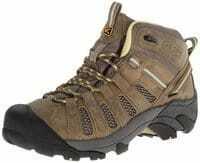 Overall this is one of the best hiking boots for men that money can buy, and should last years of continual usage. 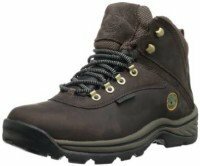 The pictured Timberland White Ledge waterproof hiking boots for men are exceptionally good when tested during cold weather, wet or rugged terrain, and carrying heavy loads over long distance hikes in the wilderness. With its advanced footing design it has perfect traction when moving either uphill or downhill, and will provide the accurate motion control required when moving through even the most difficult terrain. The lacing is easy to loop making it quick and simple to put on or remove. The padded collar and tongue shed water effortlessly. It keeps your feet warm and dry in the cold and wet, but additionally allows for perspiration when used in hotter climates. Weighing in at a mere 2 lbs, these mid hiking boots are made of tough leather which is durable and abrasion resistant; featuring a waterproof construction keeps water out preserving the dryness of your feet whilst continually providing comfort even after several miles of walking in different weather conditions. The Timberland White Ledge is a great option for those who want a versatile boot for both regular or occasional hikes. 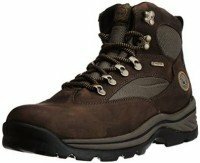 The Timberland Chocorua Trail Gore-Tex is of the most rugged and stylish men’s hiking boots on the market right now. It offers a variety of designs and color variations, making it a good choice for any fussy hikers. The exceptionally lightweight Choucorua has a removable, dual-density EVA perforated footbed which keeps air circulation optimal, with additional help from the Gore-Tex membrane which helps in keeping your feet dry from the inside out. It also features an anti-fatigue technology that provides comfort all day. Another good feature of the Chocorua are the three different adjustable loop straps on top of the boot as they provide a proper fit for different foot shapes and types. Combined comfort and durability is hard to find, but the Chocorua has it all. You can still expect the best comfort and support without getting tired after mile upon miles up any trail or elevation.